Sometimes you need to change a transaction or holding from one ticker symbol to another. For example, if a company changes ticker symbols, you’ll want to keep your portfolio up-to-date by changing the symbol too. Or, if you need to switch from the Google Finance ticker symbol to the Yahoo Finance ticker symbol for a particular security. To change the ticker symbol, follow the steps described below. Select the item whose symbol you want to change. Click on the “Details” button in the toolbar. The “Enter Purchase Details” window will open. 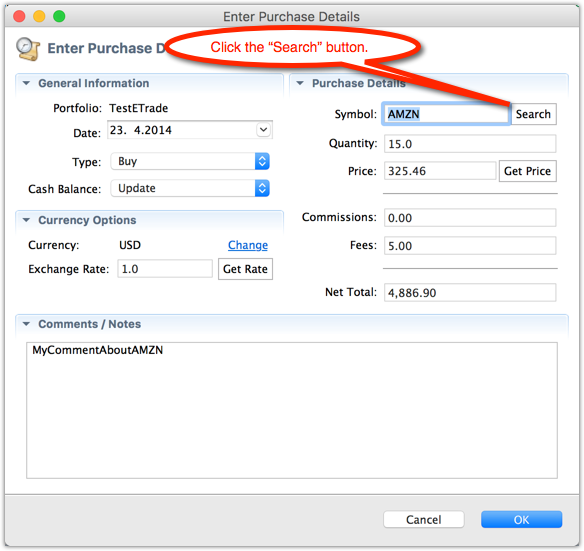 In the “Enter Purchase Details” window, click on the “Change” link to the right of the symbol. You can now change the symbol in the Symbol field. 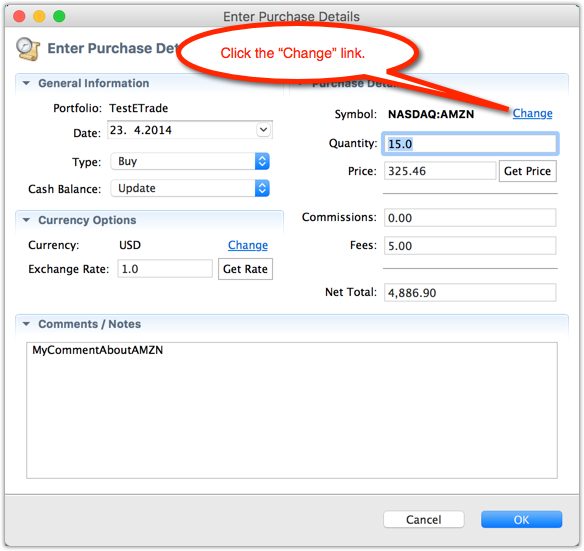 If you know the new ticker symbol, enter it into the Symbol field. Alterntively, you can click on the “Search” button. If you are changing from a Google Finance ticker symbol to a Yahoo Finance ticker symbol, remove the exchange prefix (including colon) from the ticker symbol. For securities that trade on US exchanges, removing the exchange prefix is sufficient to change to the Yahoo Finance equivalent ticker symbol. 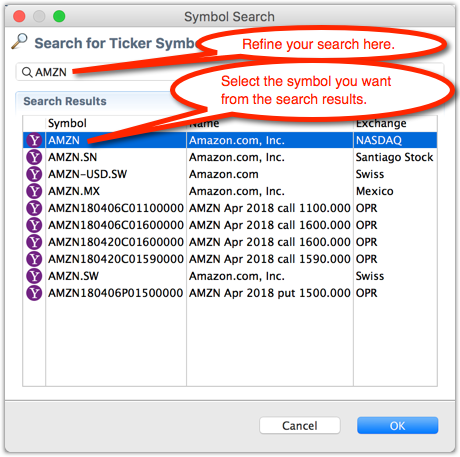 For tickers that trade on other non-US exchanges, it’s best to then click on the “Search” button to be sure you find the right Yahoo Finance ticker symbol, which will have a suffix denoting the exchange on which it trades (for example, a suffix of ”.TO” denotes the Toronto exchange, ”.L” denotes the London exchange - See this page for more details). If you clicked on the “Search” button, the “Symbol Search” window will open and show the available ticker symbols. Yahoo Finance symbols have a Yahoo! ( ) icon in the first column. Select the symbol you wish to change to, then click on the OK button in the search window. The new symbol will now be in the “Symbol” field. Click on the OK button in the “Enter Purchase Details” window. 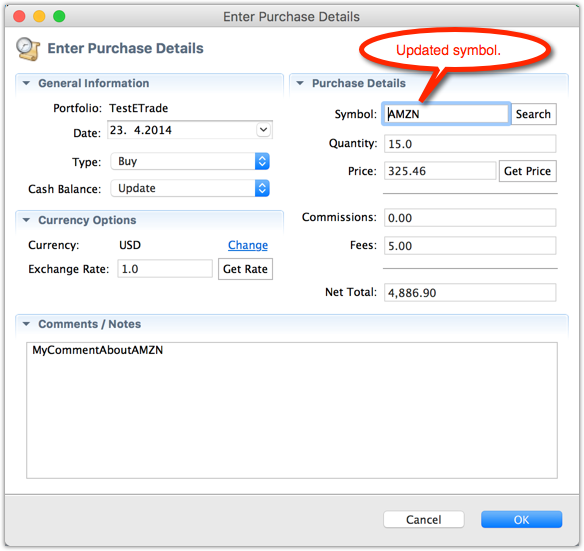 When changing the symbol of a holding in your portfolio, a confirmation window will appear. 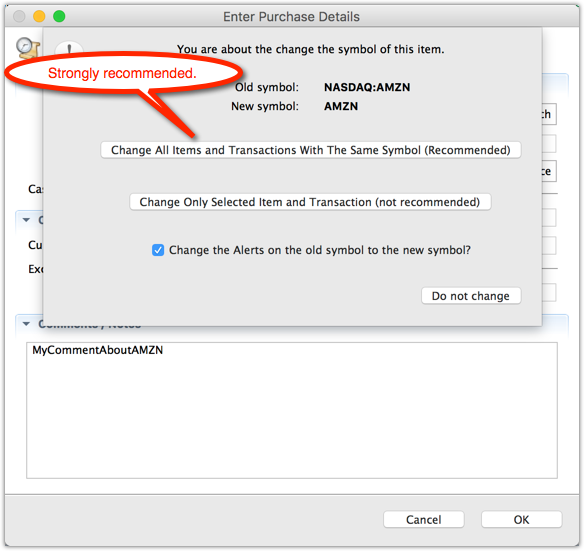 Click on the button, “Change All Items and Transactions With The Same Symbol (Recommended)”. It is usually best to change all items in your portfolio (Prices view) and Transactions that have the same symbol to the new symbol. If you have an alert setup for the old ticker symbol, you can also choose to update the alert so it uses the new symbol too (also strongly recommended). The symbol has now been updated.